Online Real Estate Continuing Education for California License. Our 45-hour self-study package provides all the continuing education (CE) needed to renew any California real estate license (salesperson, broker, or corporation and for first-time and subsquent renewals). It is entirely online; course materials are provided as eBooks (in PDF format). Quizzes and final exams are administered online. If you want	to see how our online program works, register for our	Demonstration Course. Pass our Demo before you register to earn a 15% discount when you register for this package. Our 45-hour package consists of eight courses. Six are three-hour courses each of which covers topics required by the DRE, namely: (1) Ethics, (2) Agency, (3) Trust Funds, (4) Fair Housing, (5) Risk Management, (6) Management & Supervision. 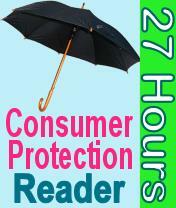 In addition to the required courses, we provide two consumer protection courses: (1) Consumer Protection Reader, Part 1 (12 hours), and (2) Consumer Protection Reader, Part 2 (15 hours). These two courses use the same 250-page textbook. This textbook has two sections. The first is “Defensive Real Estate” which is an extension of our three-hour Risk Management course and, as such, provides additional tips on how to avoid disputes with your clients. 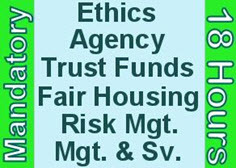 The second section is “Consumer Protection Articles.“ It contains over 100 articles most of which are from two sources: (1) the DRE’s Real Estate Bulletin and (2) RealtyTimes.com. Taken together, these articles give you a thorough review of changes affecting California residential real estate brokerage over the preceding four years (the book is updated annually). Areas covered include law, taxes, industry, financing, mortgages, settlement, risk management, and home ownership. To earn credit for any course, you must pass one of its two final exams: an initial exam and, should you fail it, a “retake” exam (details). Should you fail the retake exam, you must start over for that course. When you have passed all eight courses you print your certificate and follow our instructions for renewing your license (details). IMPORTANT: In compliance with DRE regulations, we require at least four days for study after paid registration before we permit you take any final exam; and we limit the number of course-hours you may complete to 15-hours in any 24-hour period. Therefore, the minimum number of days needed to pass all courses assuming you do not fail any course is a little over six days. For a detailed explanation of how you may pass all eight courses in the 45-hour package in six days, click here. DOUBLY IMPORTANT: You have two chances to pass the exam for any course. Should you fail its first exam, you may immediately attempt to pass a second exam composed of different questions. Should you fail the second exam, you must start from the beginning for that course; that is, you must re-read its course material, retake its quiz, and wait for its study period to pass (see above table) before making another attempt to pass the course (or any other course). The study period for the 45-hour package’s six, three-hour courses (see above table) is just three hours; but the study period for each of our two consumer protection courses (see above table) is two days! We guarantee that DRE will accept the CE credits you earn providing you complete the package within one year. We also guarantee that our CE package will provide all the CE you need to renew your license no matter how you are licensed (salesperson, broker, corporation) and no matter if you are renewing for the first time or subsequently. Click here to view our DRE-approved general information page. $37.40 if you pass our Demo first. After you pass your exams, we provide a “certificate.” It lists the DRE-assigned “certificate number” for each course. You will enter these eight numbers when prompted by DRE’s license renewal site (eLicensing). We provide renewal instructions and a link to DRE’s renewal site once you have completed all courses.